Matthew Mutch was born in Hamilton, Ontario - steel capital of Canada-and better known as Steeltown. 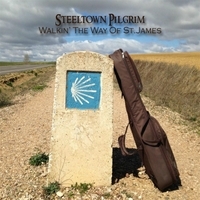 Walkin’ The Way of St. James“ is his third CD release, following the well-received “Steeltown Pilgrim” and earlier “Enter”. Matthew has actually released this third album under his pen name, "Steeltown Pilgrim". (search Matthew Mutch for other cds. The name has changed but not the style—14 new lyrically strong tunes, performed with the help of many fine and talented musicians such as Mati Haskell, Linsey Becket and producer/musician JK Gulley. All songs were inspired by the people, places and situations encountered on the Camino Santiago in Spain—love, pain, anguish and joy—-it’s all here.